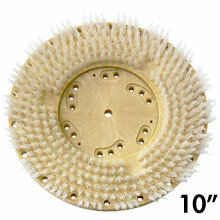 PAD-LOK Tufted Pad/Disc Driver - 10" Dia. 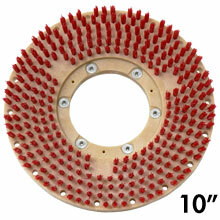 MAL-LOK Style I Tufted Pad/Disc Driver - 10" Dia. Replacement Floor Machine Pad Drivers, Disc, Bonnet, Sanding Drivers By Size. If you know your machine make & model, we suggest you visit our Manufacturer/Brand Specific Equipment Reference List section or if you cannot find what you're looking for, please call us at 1-224-654-6500 and a sales representative will assist you. PAD-LOK™ - RED Heavy polypropylene strands trimmed irregular for secure holding power. MAL-LOK™ Style I - WHITE 1" offset trimmed heavy polypropylene tufts penetrate pad at different depths for maximum holding power. An excellent choice for use on automatic machines and for bonnets yarn pads.